There’s a new destination in town for all those who enjoy chaat, dosas, Chinjabi fare and lots of freshly made Indian sweets. Say hello to Dilli Sweet House. The menu is a mix of sweet and savoury; from tantalising chaat to South Indian delights such as dosa-idli to Chinese snacks like chilli potato and Manchurian. Once you’ve had your fill of chatpata, head to the sweets counter; there’s a massive variety of mithai, including signatures such as rabdi rasmalai, sev badaam barfi, dhoda barfi and sandesh. If you plan a visit soon, do try the ghevar, their monsoon special. The peeps at Dilli Sweet House assure us that everything is prepared in clean, hygienic conditions and in pure desi ghee. Moreover, it’s 100% vegetarian. If you’re on a fast of any kind, they provide food such as chole bhature, made without onion and garlic. They do customised gift hampers for occasions ranging from Rakhi and Diwali, to weddings. 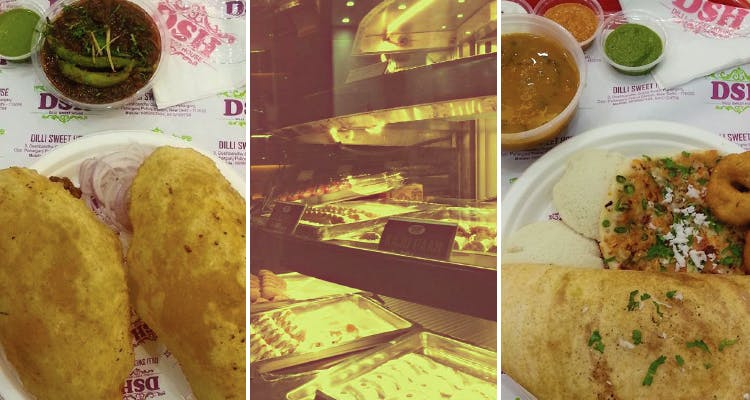 So, if you find yourself around Paharganj looking for a quick bite, Dilli Sweet House has you covered.